Want a quick brunch dish when you have a bunch of leftovers? 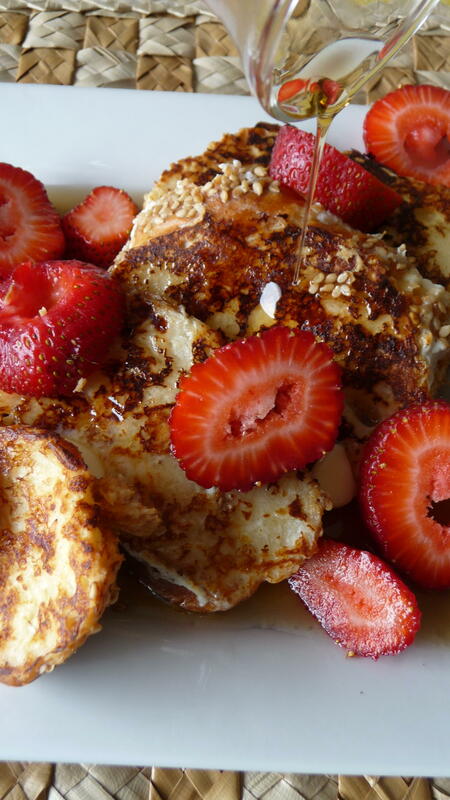 I found myself with the ends of a nice sesame challah, an egg white (left from the yolk I needed for the chewy brown sugar cookies), local strawberries which needed to be used up, and some milk which had just gone sour – I know, you probably will utter “eeew yuck!” or something to that effect. However, I find sour milk to be a great baking medium, especially when I do not have buttermilk on hand. 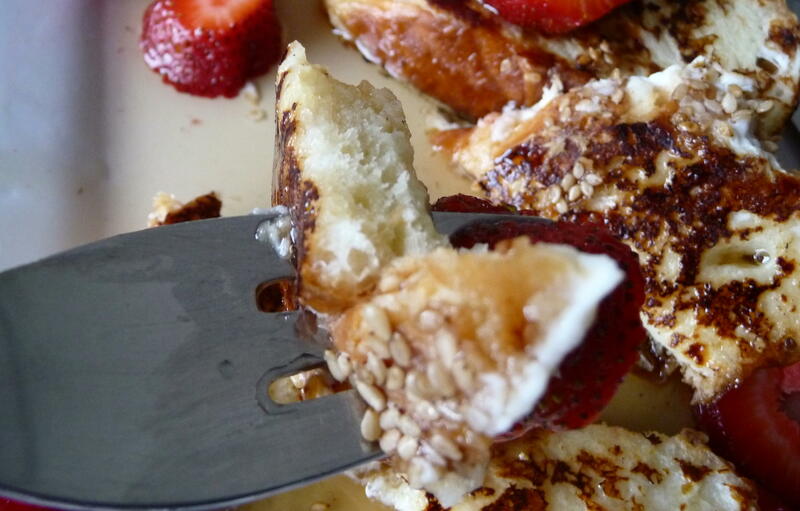 Its taste is not distinguishable at all in the French toast. Challah is a wonderful base for French toast. I love the actual French expression for French toast: “pain perdu”, or “lost bread”. (No, there is no “pain français,” just like there is no “Canadian bacon” in Canada – it is “pea-meal” or “back” bacon, here in the Great White North, eh?) “Pain perdu” always makes me think of a lonely baguette wandering the streets of Paris, not knowing its way – but maybe that says more about me and how I often felt when I lived there. This dish is known as, in French, “pain doré” – or golden bread, ” which is quite evocative; perhaps that expression is more of a Québecois thing. Anyone out there know more about this? So, keeping in mind the cliché aphorism, “waste not, want not”, I used what I had on hand to create a quick-lunch for myself. I usually would use whole egg, and, if I were being really indulgent and entertaining, I would have used half n’ half or cream, but that is not necessary nor did I miss anything richer than the 2% milk that had gone bad…bad milk, bad! Regardless, this French toast is rich, flavourful, and golden – and not at all a lost cause. Pure maple syrup – of course, I use Canadian, eh? 1. Pre-heat frying pan or griddle (it is ready when a drop or two of water does its special dance when flicked onto the surface) and add a bit of butter right before the bread. 2. Mix egg white with sour milk. 3. Place bread into dish with milk-egg mixture for about 30 seconds, flip over for another 30 seconds or so. 4. Sauté on preheated pan (non-stick does work better). 5. Turn bread over once it is golden brown. 6. Continue until the reverse side is golden brown (hence, the “pain doré moniker!). 7. 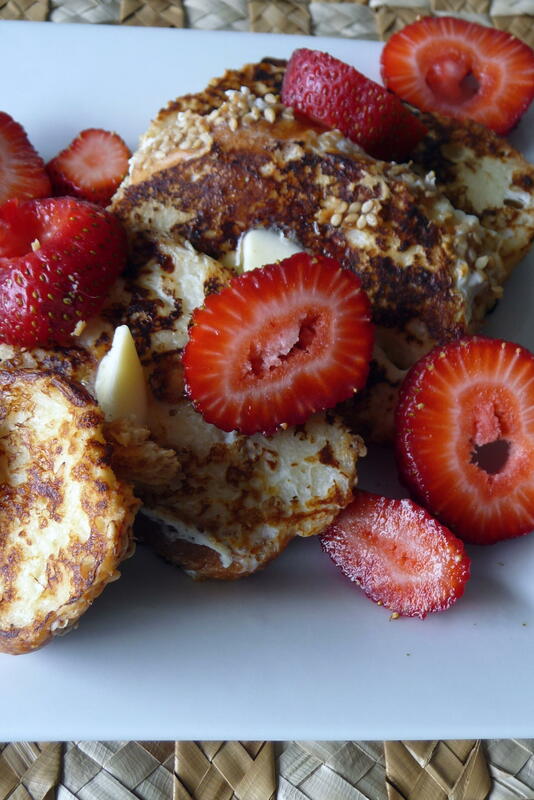 Serve with strawberries, grated nutmeg, and the maple syrup, and think of all the lost bread out there. This entry was posted in Baking, Bread, Brunch, Main courses, Recipes Misc and tagged Bread, challah, French toast, strawberries. Bookmark the permalink. Thanks for your nice comments, Rebecca. Thanks, Theresa. I am always trying to figure out things for a spare yolk or white sitting in the fridge and don’t want to waste the labour of island’s chickens. Merci, Pierre – oui, c’est vrai que le pain perdu met l’eau à la bouche! Oh yum, I’ve always wanted to try french toast with challah bread, but the opportunity always seems to evade me. Thanks for dropping by and exploring. You’d like the challah version, so try to pick up a loaf some day. I am interested in trying the Yorkshire pudding, too, as I’ve not made it for years. It will be fun! I bet that was good with the sour milk and the sesame seeds. I’m gonna have to try this one too! Hi, Gina. I was surprised that the bad milk didn’t give it an off-flavour, so it’s another good thrifty use to keep in mind. p.s. and I bet Jessie would have dished on this! Yes, Stella, you are on target – I learned the challah French toast from Jessie (when leftover from a necessary side to matzo ball soup the night before, of course!). I just did the low-fat thrifty twist, of which she would have approved. That looks so good, I’m really having a hard time not licking my computer monitor right now! I wonder if you’d have a suggestion on a challah substitute…That’s one bread I’ve yet to be able to find out here on the prairie (and I’ve yet to bother making my own, since it’s been years since I’ve attempted it!). Hi, Rachel. Thanks for your compliments, but I think you’d slap me if I were to suggest brioche as a substitute (though – who knows? – brioche could be easier to obtain than challah in Brookings…). There are other egg breads that have a similar texture, which are part of various cuisines, yet I can’t think of one right now. Nah, I’m not the slapping type–Kicking is more my thing (although I’ve gotten out out of that habit ever since I broke a bone in my foot after kicking a cement wall in my college dorm many years ago). 🙂 Yeah, I haven’t seen brioche ’round these parts either…Although I’d be willing to bet that if I hunted down in Sioux Falls some time, I might be able to track one or the other down. It’s probably going to be easier if I just make my own, though! Thanks, Debby. I like your thinking – the Ramos Fizz would be good for a leftover egg white (a sole white won’t fit in my very, very full freezer, what with all the other stuff, including odds and ends of bread – that I think would be good for stuffing, croutons, crumbs, etc. but never seem to do…).